This is a big one, because in the course of a year, you could save thousands of dollars if you are renting a house or apartment at a reasonable cost. So, what’s “reasonable?” At Retire for Less, we say reasonable rentals would be $800 or less; naturally, if it includes some utilities or services, all the better. 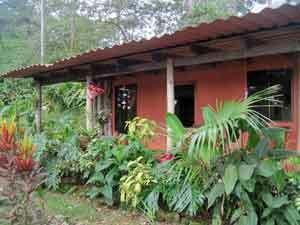 The Cabinas – We lived at “the Cabinas” for three years and 9 months. At the time, we paid $600/month with everything included: Sky TV, high-speed Internet, weekly house cleaning, propane gas for cooking and hot water, electricity, water, and use of a washer and dryer. 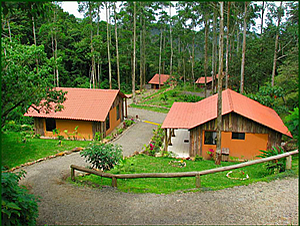 The cabinas are furnished, include linens and the basic kitchen setup. Additionally, the Cabinas offer great security at no additional charge. Every cabina has a monitored security system. NOTE: the price has gone up over the years and now costs $700/month ($750 if you have pets) with everything included – still a great deal. 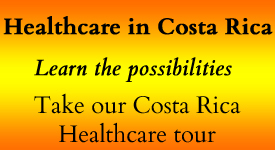 All of the extras would cost at least $200, so think of the rent portion of the monthly fee as about $500. 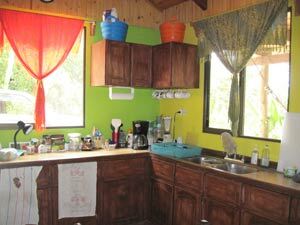 Here are a few pictures of our cabina. Since we lived there long-term, we added lots of personal touches. 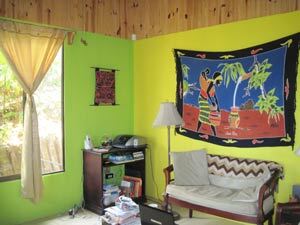 We even picked out the bright, tropical paint colors, paid for the paint and supplies, and Cesar, the manager, painted our cabina for us. 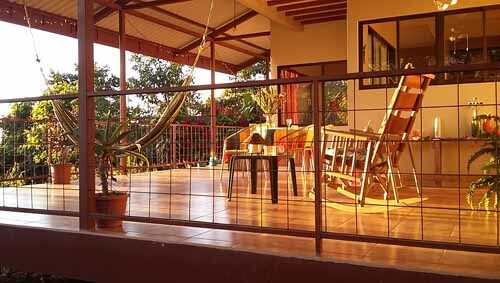 Our rental house in Magallanes de San Ramón – We had a great deal here as well. The owners had previously rented the house for short-term rentals for $600-$650/month. When they decided to rent to someone year-round, they offered it to us for only $500/month. The house was fully furnished and outfitted. We had to pay for all utilities, though it did include a gardener. We lived there for a little over four years. 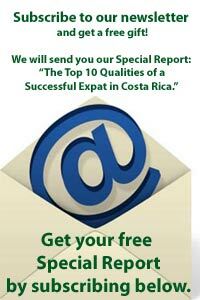 If you are like us, and don’t have much money, it helps to have a reasonable rental. My Social Security is only $1,008.00 USD, plus we have a small pension of Gloria’s of $152/month USD. The average Social Security pension in the U.S. is less than $1,400/month. If you have a lot of money, it may not matter. 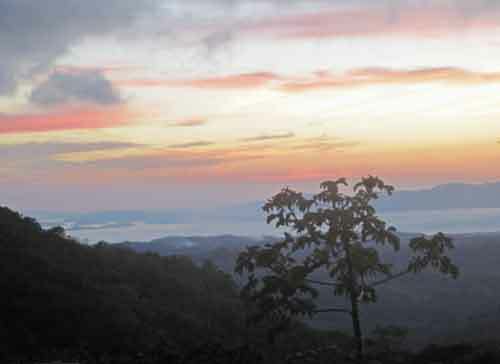 Though we recommend you rent, rent, rent when you move to Costa Rica, we realize that some folks will still choose to buy, either early on or after they’ve been here for a while. Though we are not realtors, we recommend purchasing properties under $150,000 because they are both easier to buy and easier to sell. 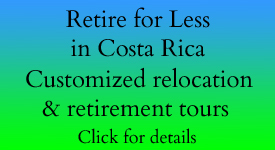 At RetireForLessInCostaRica.com, we often run across real estate opportunities that fall within our “Retire for Less Philosophy” — in other words, properties that offer more value for less. So, we will bring you homes for sale that are $150,000 or less, and lots that would allow a modest house to be built on it for about the same price. Of course, upgrades will always cost more and are at the buyer’s discretion. 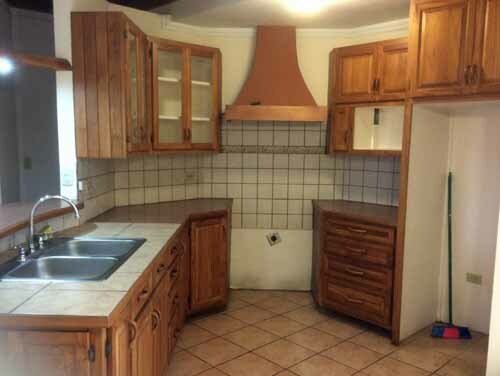 House size: 2,380 sq. ft. 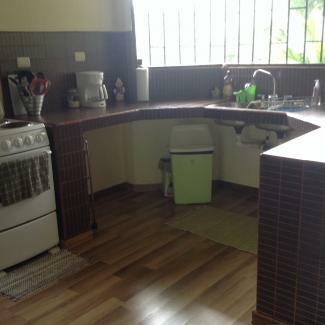 This spacious, comfortable home in a quiet & friendly residential neighborhood of Nuevo Arenal has been renovated by a North American who is now selling it completely furnished and has made it very livable. It was built with concrete and steel for strength and has spacious rooms – 4 bedrooms, 2. baths, a large game room added in back which could be converted into separate apt. This home has been kept in perfect condition by the American owners and has all the conveniences and extras expected for comfortable living including central air. There is a large back yard with many fruit trees. A very large screened porch with a built in fire place. 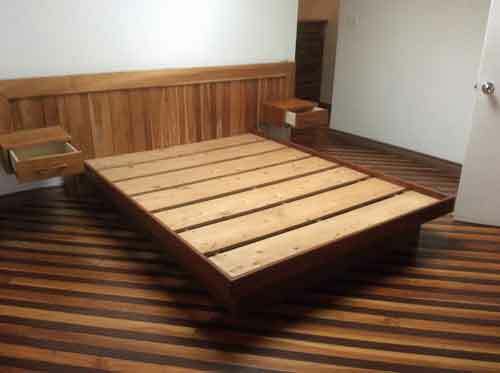 The size of the interior is 2380 sq. ft. and is on a double lot with a carport. Plus, it is within walking distance of the town center, yet it is in a non-commercial area of updated residences far enough away to be quiet and private. Situated in a very quiet neighborhood. Click here to read more about propery #194, see more photos, and contact the realtor. 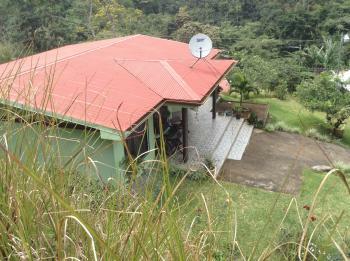 New, Affordable, and Comfortable Home with Beautiful Views-$99K Reduced! 5 year old home with laminate flooring, tiled kitchen counter-tops, upgraded kitchen cabinets and bathroom, concrete driveway, front porch, reserve water tank. Sitting on top of a hill overlooking the mountains with incredible views. The land is planted with many different types of fruit trees. 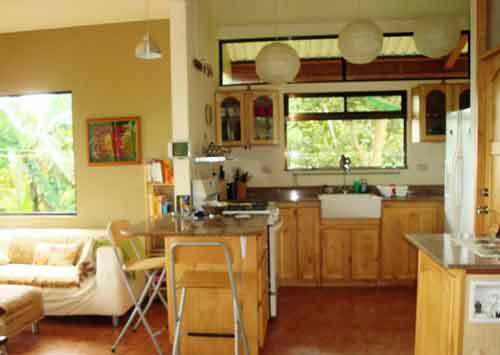 A smaller home which requires very little maintenance, perfect for a couple or a single person. 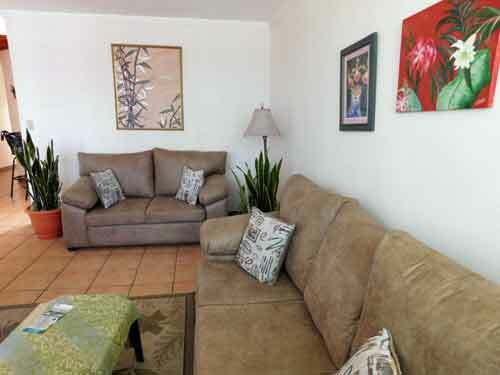 Five minutes away from downtown San Ramon but in a quiet area away from noise and pollution. Click here to read more about propery #197, see more photos, and contact the realtor. Great altitude and location, there is a lot of potential in this home! This small home is located in one of the best areas of Grecia. The house is off a main street so it is quiet, but the main street is easily accessible where there is bus service. 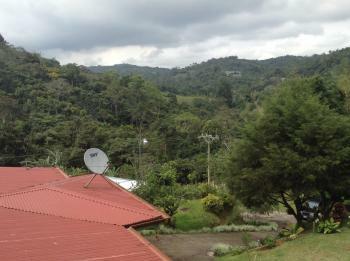 The house features views to the east of the Central Valley and the coffee fields that abound in this area. The dining area, living room and kitchen all have these views. You can read all of Paul’s Money Saving Tips at this link.